Day twelve of the second Daily Marker 30 day colouring challenge and today I really did simplify the colouring with a cute little critter and his umbrella. 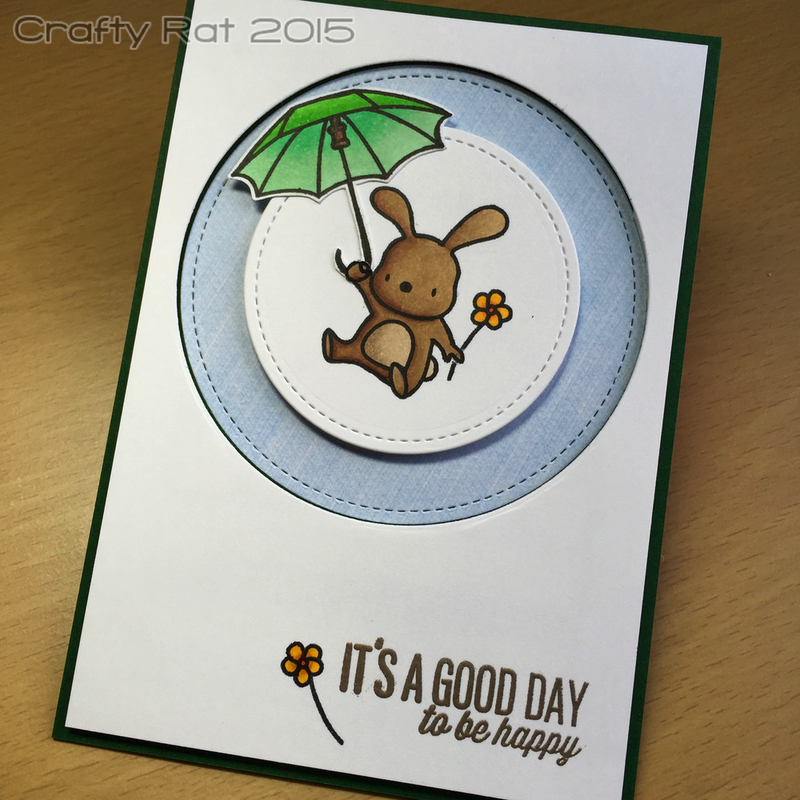 I stamped the umbrella and the bunny separately and die-cut the circle the bunny’s in before colouring them with Copic markers. I fussy cut the umbrella — there are matching dies available, but I don’t often buy those as they’re significantly more expensive than the stamps (so I can just buy more stamps instead) and I am happy fussy cutting most things. Then I prepped the main panel by die-cutting the larger circle from it and also from some patterned paper to use as a background. I heat embossed the sentiment and then decided to add the tiny flowers, which I coloured with Copics. One note about the sentiment: it says its rather than it’s. There is a gap between the t and the s in its, so they did leave space for an apostrophe, but you do have to add your own and this is where a VersaMarker comes in handy if you’re heat embossing. The only “trick” with assembling the card was to use a knife to cut around the hand that would hold the umbrella so that I could slip the handle behind it. That and oodles of foam tape to raise the white panels and give the card some dimension. With Copic shading, it really is worth going back over some areas with your darkest colour just one more time. Check that sentiments have apostrophes where they need them. I have at least a couple that are missing them.